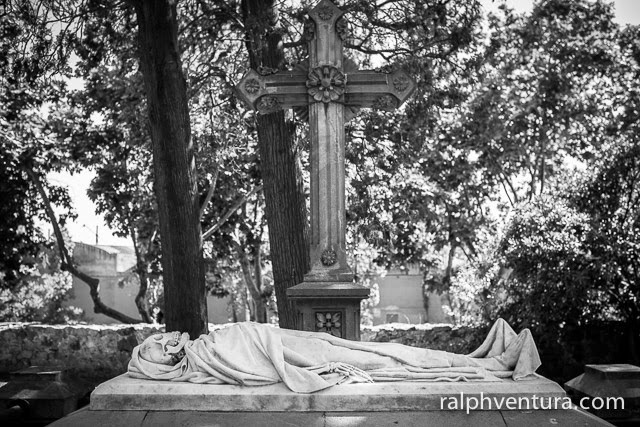 With Halloween nearly upon us and the Day of the Dead shortly thereafter, I have uploaded a gallery with photos from two of the world's most interesting cemeteries, Cementerio de Montjuïc in Barcelona and Père Lachaise in Paris. The two are completely different. Click here to view the gallery. Montjuïc sits on a rocky hill in the far outskirts of Barcelona. I visited in 2009 with my daughter on a hot, clear and bright June day. Because of this, the photos show a brilliance to the day that makes a strong counterpoint to the subject. Built on a series of terraces cut into a hillside with staircases leading from one to the next, Montjuïc is huge. Although we spent most of the day there, I think we barely saw a quarter of the place. My experience with Père Lachaise was exactly the opposite. First, it was cold and pouring rain most of the day, which makes for pretty gloomy photography that matches the theme. Also, although not centrally located in Paris, it is nonetheless a short walk from the metro in Paris proper. Many celebrities are also burried in Père Lachaise including Jim Morrison, Edith Piaff, and Oscar Wilde. Wilde's grave is by far the most interesting of all. Done in an Egyptian/Art Deco style it attracts so many visitors that it is cordoned off with a wall of inch-thick plexiglass on which people have written their dedications to his memory. The dedications are both intimate and moving. It's obvious that his writings and his life have touched many people. All the photos in the gallery are available for purchase in sizes from 8x10 to 20x30 and can even be delivered already mounted and framed in a wide selection of styles. Click here to view gallery and purchase prints. It's been a while since I last posted, but I have been very busy, . . . and besides, it was summer. OK, whatever. Anyway, the season is about to start and I have made a break with the past. I've been working with models, strobes, backdrops and, drumroll please, . . . in color. Yes, in color, but not just any color, in red, the brightest, most in-your-face color there is. The models are beautiful, the photos are great. The Red Sessions will be on exhibit at my new studio at the Bakehouse Art Complex, Studio 14, September 12 from 7-10PM. 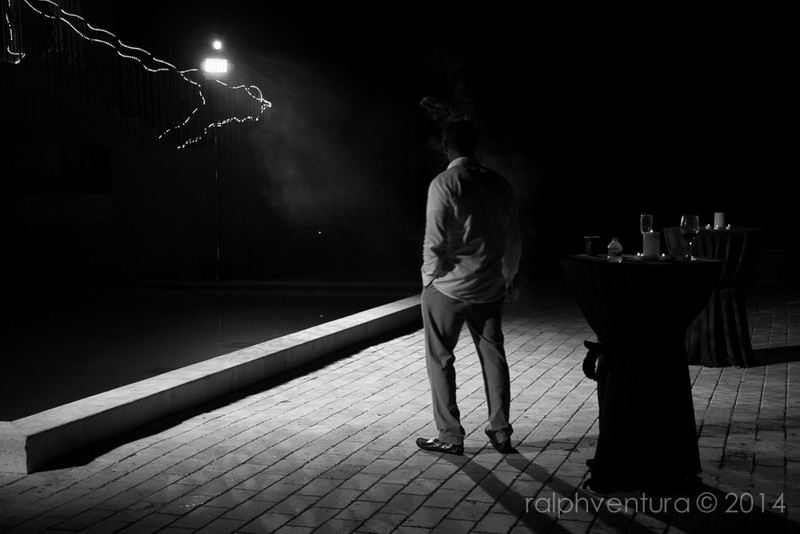 When I first got the invitation to exhibit two photos in a group show at the Blu Moon Gallery in Coconut Grove, I intuitively knew which would be the first but wasn't so sure about the second. The show, entitled Put A Bird On It, is themed around birds. I knew I had to exhibit a photo of birds on power lines as it fit perfectly with the theme. Initially, my choice for the second image was one taken in Martha's Vineyard in 2012 but I discarded the thought as I considered it was too rural an image to pair with the first. I knew I needed something grittier. I then turned to my Roosevelt Island series. Roosevelt Island is situated on the East River between Manhattan and Queens and is mostly accessible by cable cars. It is a rather small, mostly residential island and really not too attractive at all. Still, in November 2012 it proved to be one of the last areas of New York I hadn't explored. 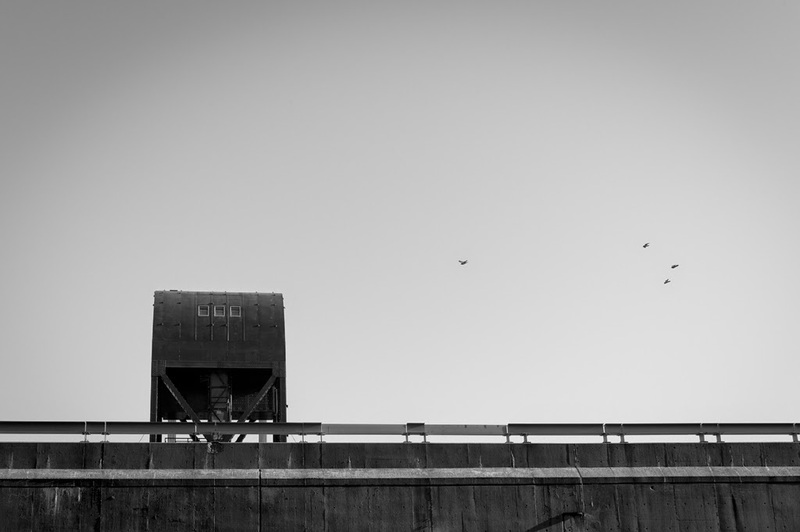 I vaguely remembered that I had shot shot some sort of iron structure against a cloudless sky and that there might actually be birds in it somewhere. So I pulled the image and immediately knew I had to include it in this show. It's got just the right amount of grit and just enough birds to qualify for the show. Love it. Put A Bird On It will run through May, 2014 with an opening reception on May 3, 2014 at the Blu Moon Gallery, 3444 Main Hwy, #7, Coconut Grove, Florida 33133. The promo and photo of Untitled (Birds on a Wire) is shown below. 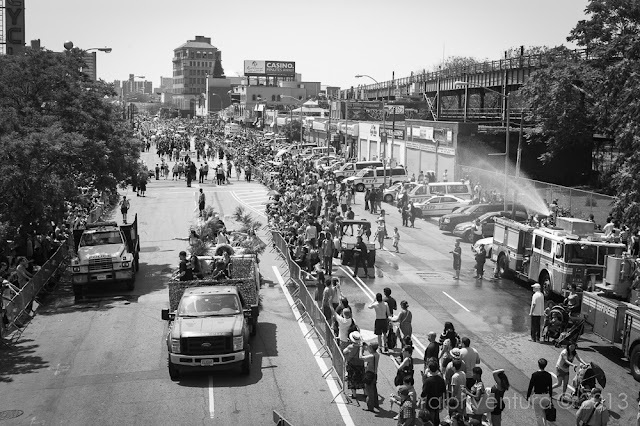 Last June we attended the Mermaid Parade in Coney Island, as I've done many years before. Shortly afterward, I posted on how the cops had ruined a perfectly good parade by cordoning off most access points and herding the spectators into pens like cattle. It was really overblown. In all fairness, though, this came right on the heals of the Boston Marathon bombing so I imagine New York's Finest were on high alert. Still, I felt it was overdone. Anyway, we did manage to make it onto the boardwalk, which is IMHO way better than the actual parade anyway. While wandering along, eventually we stumbled into a party. Nice, I thought. I pulled out my ME, framed an image and immediately felt constrained by my 50mm Summicron. It just felt too narrow. Prior to my Leica years, used to shoot a Canon 1D Mark 2 mounted with a 28mm Canon f/1.8. Given the 1.3 crop, the 28mm effectively became a 35mm (28 x 1.3 = 36.4). I bought it when I felt the need for a good, everyday prime lens. I had wanted a 50mm field of view because so many famous photographers have used that lens. It's even said that you can shoot the world with a 50mm lens. So shooting a cropped sensor camera at the time, I thought to get a 35mm to give me a near-50mm field of view (35 x 1.3 = 45.5). At the time Canon's 35mm lineup was either not enough or way too much. It was a choice between one that was really light and cheaply built or a second that was astronomically expensive and as heavy as a zoom lens. So, I went with the 28 for an effective 35mm field of view. I quickly learned two things. First, this field of view is perfect for shooting scenes in your immediate surroundings. In other words, scenes where you are a participant. You can be part of a conversation, at a normal conversational length, and still photograph the other person; very useful indeed. Because of this quality, scenes photographed with a 35mm contain a sense of context that enables a viewer to fully understand the image. Second, it is virtually impossible to use as a portrait lens in vertical orientation, unless you shoot a 3/4 body portrait. But for tight headshots it was too wide. Still, I shot New York, Denver, Barcelona, Chicago and Miami with that lens and really grew to love the 35mm field of view. For years, that was my go-to combination. I still have that camera and the lens and have recently used both. When I got my Leica ME, I had now re-entered the "full-frame" world and thought to get a true 50mm. I bought a used Leica 50mm Summicron, a lens that is generally regarded as the gold-standard of 50s. The lens is very sharp wide open at f/2, with beautiful and smooth bokeh. Also, because of its narrower field of view, it lends itself to impromptu portrait as well. You can shoot a scene, like a 35, but will have to take two or three steps back, just enough to be next to the action but far away to be just outside of it. Because of this remove, it's a lens that make you more of a spectator than participant. Still, the 50 lends itself to both scenes and portraits and is in this sense a much more versatile lens than a 35. So, on this day I ventured into the crowd armed with my 50 'cron and immediately was struck with a sense of claustrophobia. The 50's field of view was too narrow to shoot in a crowd, at least easily. I felt like I was too close, like the shots would lack the context necessary to enable a viewer to make sense of the image, the very context that a 35 would provide. Still, this is what I had with me and what I needed to shoot. Afterward, when viewing the photos, I came to a slightly different conclusion. Yes, the 50 is tighter, but it's photos are not claustrophobic. The photos that come from a 50 in a crowd are intimate, they draw you into the action and make you feel you're right next the people, invading their personal space. This isn't easy to accomplish, by the way. To adequately shoot a 50 in a crowd requires an understanding of the crowd and a sense of tracking people in the crowd with the lens, something that is easier said than done. 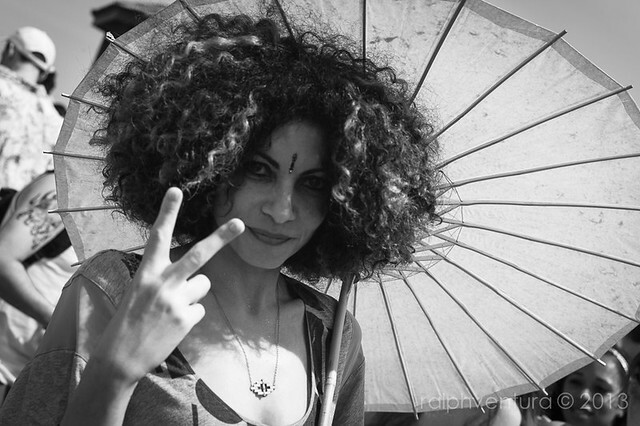 When properly done, however, it can yield a sense of true intimacy in the photos. Without question, for crowds a 35mm field of view is much easier to shoot and will easily give a great result too. The 50 is narrower and I found much harder to shoot in a crowd but when successful, though, the shots from a 50 are intimate and personal, something the 35 really doesn't accomplish. You can view images from the mermaid parade here on my Flickr feed. I have hardly any photos of myself. 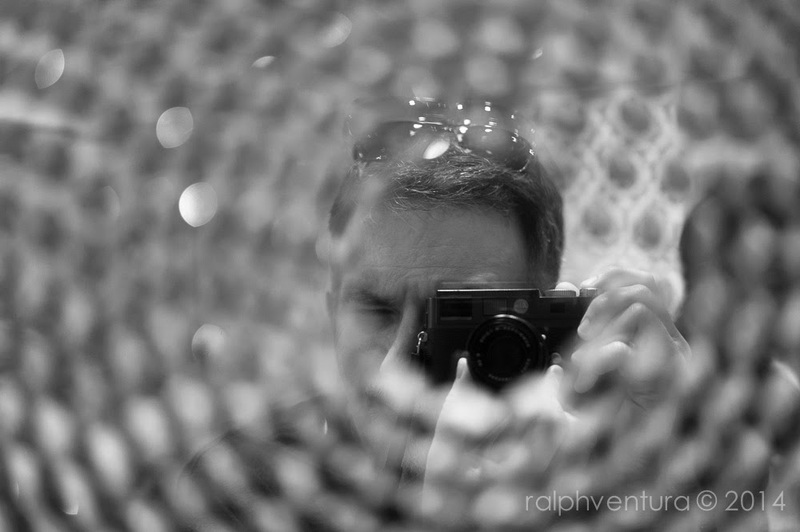 Those that I do have are generally of me with a camera in my hand shooting something else, oftentimes out of the frame, or self-portraits taken in something reflective, like this one shot at Art Wynwood in February of this year. I really like this photo. I like the way it's framed on the right by the two tables and how the edge of the pool cuts across the bottom demarcating the lighter brick from the dark water. I really like how the subject is just standing there, looking off into the distance and that string of lights that just seems to hang there. What I like most about it, though, is the strong contrast of light and dark hues. It takes what would have been an OK shot, and adds an air of drama to it. It's also plain luck. My flash didn't go off. I was shooting an event in January and outshot the flash's ability to recycle. I realized it when reviewing the photos at home. A bit of boosting the ISO and some work with the sliders, convert to B&W and voila: an unlucky photo is turned into a noirish image. Sometimes an unlucky event is actually serendipitous. Nice. Canon 6D, ISO 400, 1/45 sec., Canon 24-105 @f/4, no flash. In my Artist's Statement I write "that most of us will never write a great novel, but all of us will live one" and that I photograph these great novels and thereby "bear witness to life." I can't think of a better photo to illustrate my point than the one above. My parents and my maternal grandfather are buried in this cemetery. I visit every now and then, but really not too frequently. If there's an afterlife, then that is where they are and I hope they keep me in their thoughts. If there isn't one, well, then they continue to exist in my thoughts and feelings, and occasionally in my dreams as well. Visiting their graves will neither help them in any afterlife, nor bring them closer in this life, so I really don't visit often. Obviously, though, as this photo shows I do visit occasionally, sometimes to take my elderly aunt who cannot drive herself there. 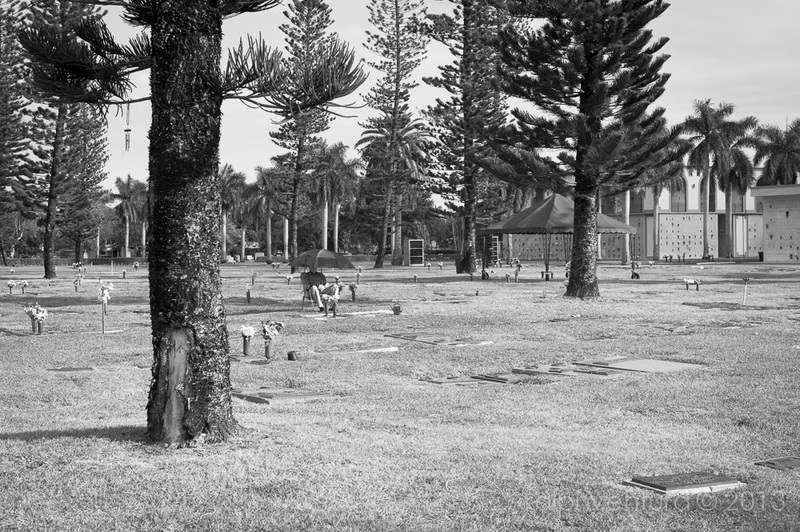 On this occasion, we encountered this gentlemen sitting under his umbrella in the blistering Miami sun, just staring at a grave. I assume his wife is buried there, but perhaps that is too pat. Perhaps it is life-partner, someone he couldn't marry, at least not under Florida law. Perhaps it is actually worse, perhaps his child is buried there. Now that would truly be horrible as parents should never have to bury their children. Whoever it is, though, I'll never know. All I know is that on this day I bore respectful witness to his grief, to his devotion, to his very life and for that I feel truly honored. On this Valentine's Day, two photos of my dear friends, Ciro and Beverly, taken at Flemings in Coral Gables. At dinner with them I just squeezed off a few shots. It was dark outside and they were illuminated only by the window to the left and a spotlight above, perfect conditions to shoot in available darkness. Leica ME, Voigtlander 35mm f/1.4 @ f/1.4, ISO 640, 1/30th sec. Since I was a kid, I've loved city life. New York, Barcelona, Chicago, Paris, . . . the hustle and bustle of daily urban life energizes me and always leaves me wanting more. My earliest memories are of Chicago, a city that is pretty much accessible by anyone on foot. I remember the buildings and the pedestrians wherever I looked. The city was busy and the people all looked like the had somewhere to go. Most of all, though, I remember the buildings. These were mostly midrise, 4 and 5 story brownstones scattered through Lincoln Park and Wrigley Town, where we lived. The downtown, however, was and still is magnificent. I felt an extreme disappointment when we moved to Miami. Having been accustomed to the hustle and bustle of America's Second City, Miami in those days was nearly rural. Slow, hot and virtually inaccessible except by automobile. In the ensuing years, I've seen Miami grow to the urban center it now is. I still would not compare it to the major metropolises of the world, but it's certainly head and shoulders above where it used to be in my youth. The photo above is entitled Terraces. It was shot in the Brickell area of luxury condo, essentially a large box comprised of may smaller boxes in which individuals store their stuff and live their lives. Here's the thing, though, with enough of those boxes you have a viable city. That's Miami today. 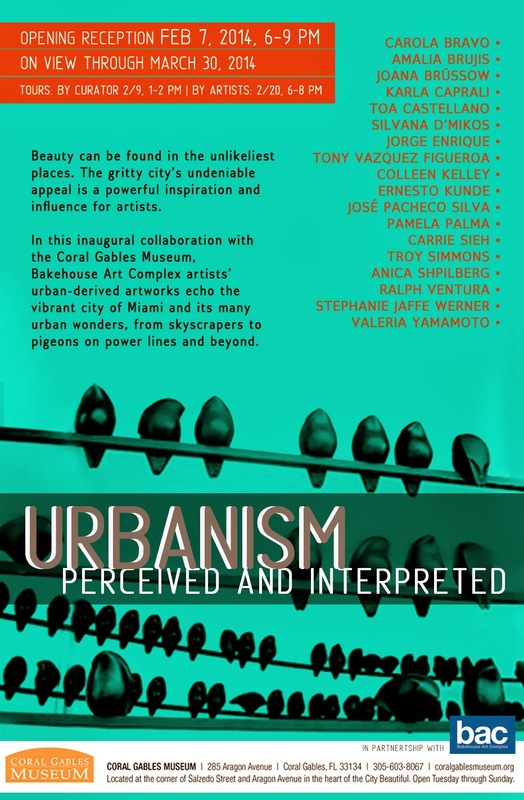 Terraces is my contribution to Urbanism Perceived and Interpreted, a group show at the Coral Gables Museum. Along with Terraces, the works of 17 other artists will be on exhibit as well. The opening reception will be held on February 7, 2014 from 6 to 9PM. This is my second Best-Of post, the first being from December, 2012. This year's set contains 15 images, all but one shot in the first half of the year. As with last year, the number could have been higher or lower, it just happened to be the number I truly liked. Unlike last year, I won't post all of them, but will only comment on the POTY and the runner up. The entire set is viewable in my Flickr feed by clicking here. The POTY, Drive Thru, was shot in Wynwood on my return from my studio at the Bakehouse. I was stopped at a light and just raised the camera and snapped off a shot. Composition and tonality are the two things I like most in photography and the reason I shoot predominantly in black & white. This image has it all. The sign on the extreme right third of the image tells you exactly where you are and acts as a counterpoint to the subjects on the left. The left-side is lighted nearer the bottom whereas the right-side is lighted from where the left-side leave off all the way to the top. The people in the image, though, complete the photo. They are illuminated by the store and almost organically a part of the image. 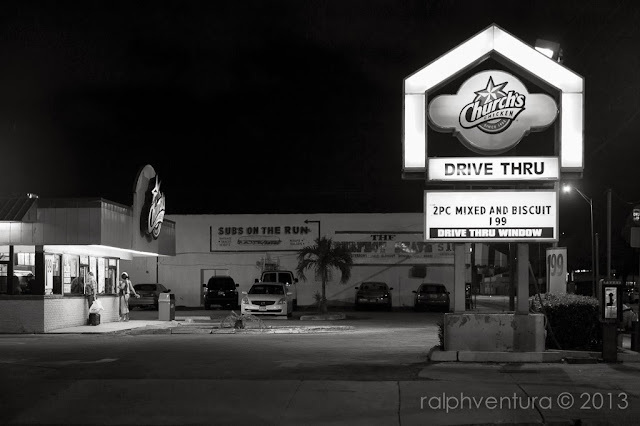 Because of the tonality, the interplay between light and shadow and the presence of people engaged in ordinary tasks, this photo has always reminded me of an Edward Hopper painting, albeit in black & white. The premier of 15 Hoods went very well. Despite the event coinciding with Yom Kippur, we seemed to have plenty of people in the studio and throughout the Bakehouse as well. Both the photo and the installation drew favorable responses from visitors and three inquiries for possible future shows. Not bad, I think. The photo, shown above, is about 30x40 inches as currently displayed. However, because each portrait is a distinct image ranging from 10 to 12 megapixels after cropping, the image should be indefinitely scalable. Projection on the side of a building anyone? The models in the photo range in age from toddler to middle age, male and female and yes, the guy second from the right in the lower row is me. The idea of the piece was to render 15 nearly identical images in black & white, except the middle image which is clearly identifiable as a young African American male and is rendered in full color. Essentially, each of us can look nefarious in a hoodie under the right conditions but society's attention is still drawn to the black male above all others. 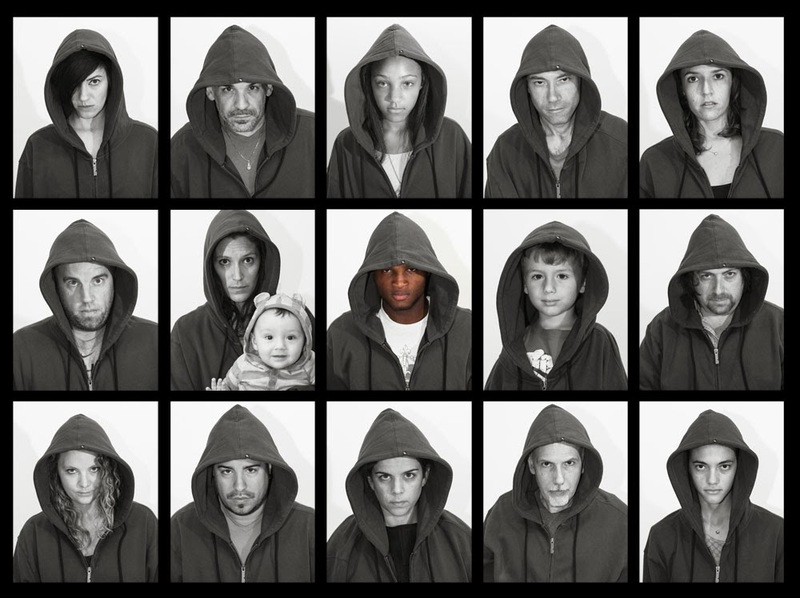 Along with the piece, the installation also included out-takes and informal portraits of the models intended to show that they are really just people in hoods and that at heart we are all the same. Rounding out the installation is a series of images from the vigil for Trayvon Martin at the Torch of Friendship earlier this year. The installation will remain on exhibit through October, 2013 in the Bakehouse Art Complex, Studio 3U and by private viewing by appointment. Immediately after the story broke, I remember feeling a sense of surprise and indignation that the Sanford Police let George Zimmerman go without much thought based on Florida's "Stand Your Ground Law." I felt that they, at least, ought to have asked the simple question, Which of these two actually stood his ground and confronted an attacker? Was it the older man who acted against the direct instructions of a police dispatcher or the young man who was being stalked by a "creep" in an SUV? At the very least, I thought the SPD should have referred the case to the State Attorney's Office, if for nothing else then just for CYA purposes. That surprise, however, was nothing compared to the surprise I felt when the Special Prosecutor filed charges of second degree murder against Zimmerman in the absence of much supporting evidence and absolutely no witnesses or apparent motive. Being legally trained, I felt the better charge, the sustainable and provable charge would have been manslaughter. It also had the added benefit of comporting with the provable facts. When the jury returned its verdict, I felt justice had not been served but that they had nonetheless rendered the legally correct decision. In computing, there's an axiom: GIGO, garbage in, garbage out. You can't blame the computer if you ask it the wrong question or ask the right question but in the wrong manner. Similarly, you can't really blame the jury if you've asked it the wrong question and given it no option but to return a bad answer. I wasn't surprised, but like many, I was disappointed. I was, however, very surprised at the steps the right-wing corporate media took to legitimate the shooting by demonizing an article of clothing, the hoodie. Most infamous in this regard is Geraldo Rivera who is quoted in The Huffington Post as saying that "hoodies reminded people of criminals like the Unabomber and thus put (the wearer) in danger". I must confess, I have long since stopped watching or reading the right-wing corporate media. While Faux News is the worst offender, in my opinion, the so-called mainstream media are little more than stenographers to power. Still, using this article of clothing in order to legitimate the death of a young man who was doing little more than walking in a neighborhood that he had every right to be in was a new low, even by today's debased media standards. It's as if none of the so-called reporters have children who wear hoodies. Seriously, don't they know any seventeen-year-olds? And so was born my idea of 15 Hoods. 15 Hoods is both an image and an installation. The image, consisting of 15 portraits of people wearing hoods, will be shown for the first time on September 13, 2013 at the Bakehouse Art Complex, in my Studio, 3U on the second floor. As an installation, it will also feature background images, outtakes and a separate set on the Vigil for Trayvon held at the Torch of Friendship in Miami. If you find yourself in Miami that evening and do not have to attend Yom Kippur services, I hope you will consider attending. To the rest of the world, I live and work in Miami. To residents of "Miami", that actually depends on where you stand. 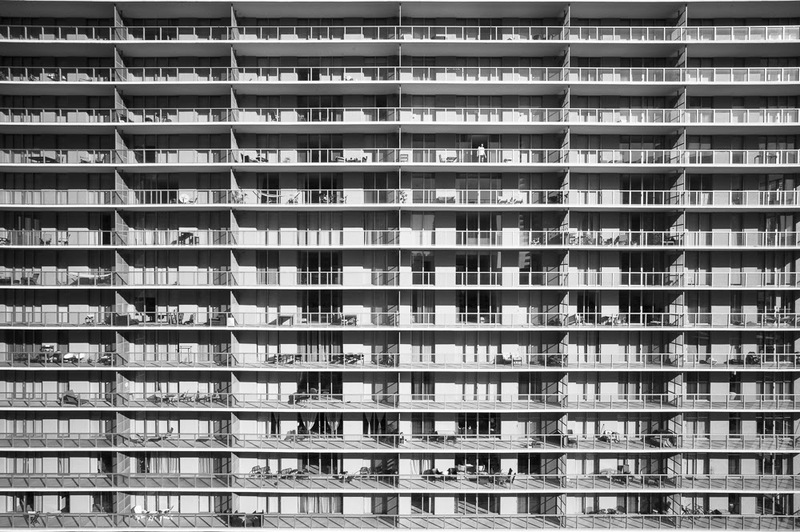 Like the cities of London, Boston and Atlanta, "Miami" is a conurbation, "a region comprising a number of cities, large towns, and other urban areas that, through population growth and physical expansion, have merged to form one continuous urban and industrially developed area." Wikipedia. Miami is a conurbation of over 30 cities that have grown to the point that they abut in a nearly continuous manner, almost like a jigsaw puzzle, each with its own feel and vibe and even its own socio-economic demographic. One of these is Coral Gables. Known here simply as The Gables, Coral Gables offers a counterpoint to the region's hub, the City of Miami. While the City of Miami is very urban, with many run-down neighborhoods next to beautiful high-rises, and many neighborhoods that seem to be in a state of perpetual gentrification, The Gables is the city that just seems to make everything work. It is clean, relatively well-run, and close enough to the urban center that it defies the term "suburb". Like everything in life, though, it does have its trade-offs. While the City of Miami can seem at times like part of the developing world, it is a bustle of activity and unexpected experiences. It is not uncommon to drive past a group of people protesting against the Castro regime, then encounter a group of hipsters strolling down Calle Ocho, bankers and lawyers on Brickell and finally pass some homeless-looking guy, on a bike, carrying his dog strapped across his back like a wounded soldier. I'm not exaggerating; I've actually seen all this. The Gables, though, seems to screen out any such unexpected encounters. It is the embodiment of a mature and solid city, home to many doctors, lawyers and accountants. An example of the differences is Carnaval. Both the City of Miami and Coral Gables each has a Carnaval, but the two cannot be any more different. Miami's is raucous, loud, jittery and crowded -- and I don't mean any of that in a bad way, either. 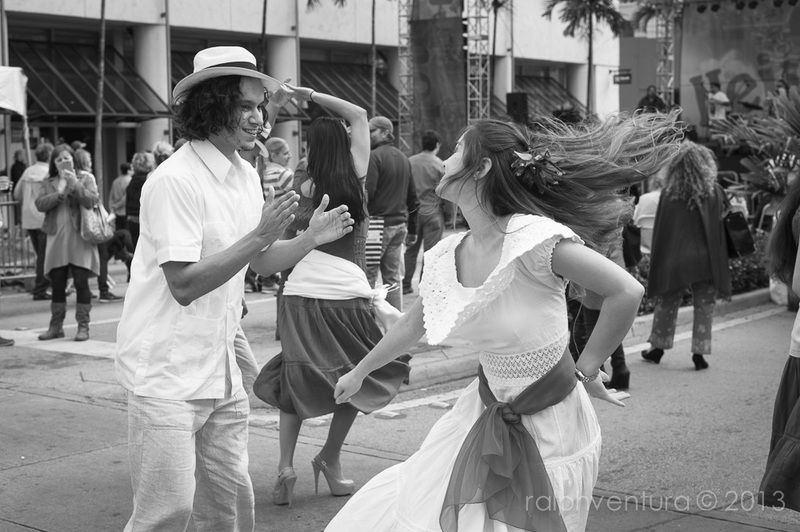 Carnaval on the Mile, as it's known in Coral Gables, is pleasant and well behaved. I also don't mean that in a bad way, either. It's essentially the difference between a Daddy Yankee concert and one by Gloria Estefan. You can enjoy both or either, but just not the same way. The photo above was taken during Carnaval on the Mile, on the last day actually, a beautiful Sunday afternoon. The dancers look young, wholesome, and vibrant. The street is clean, even after three days of Carnaval, and the event appears well-attended but not overcrowded. That's The Gables. The photo also will be on exhibit in the Coral Gables Museum this summer in their Capture Coral Gables show. The opening is July 5, 2013 at 6PM. Leica M-E, getting some love. Couldn't resist. Can't tell if the lens is a 50 Summicron, but sure looks just like mine. Content is copyright 2004-2012 Ralph Ventura. Photos are copyright their original creators. Simple theme. Powered by Blogger.